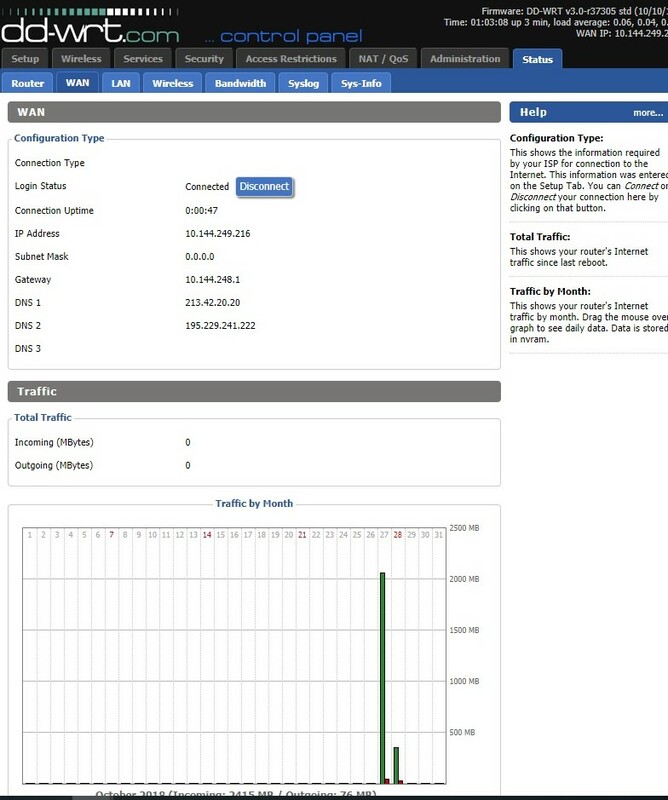 Does is show a public ip address on the WAN port? Would probably also help to know PPPoE to what, exactly. Which ISP, etc. That might factor in to how you need to configure. Was confused with this a couple of times. You can check and rule out these points before trying anything else. Other than the above two - it could also be something in your firewall script that blocks internet. If problem persists, post some information about this aspect too. Your screen-shot shows a private address, not public. Have you contacted your isp? We are seeing similar symptoms on recent builds with both PPTP and PPPoE. It appears that the PPP client (which is common to PPTP and PPPoE) within the DD-WRT router may be crashing during the first connection attempt after the router boots. Developers, please investigate! I have packet dumps of failed and successful PPTP connections available if they'd be useful. I would love to revert the affected routers to an earlier build of DD-WRT, but some of them are TL-WR940v6 routers, which were not supported until after the PPP bug surfaced. I'll have to pull all of these routers out of service until there's a fix, so I would greatly appreciate it if the developers could investigate this problem quickly.